The day after the three year anniversary of hurricane Katrina, this is what I’m staring at. . .
Yep, that’s right. 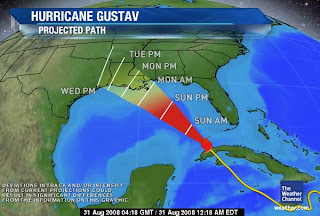 . . it’s the projected path of Hurricane Gustav. Looking at it makes it feel like gremlins are tying knots in my stomach, but I can’t make myself stop. And right between the line labeled “Mon AM” and the one labeled “Mon PM” are all the people Jakob and I love (other than each other, of course). Hopefully, at this hour they are far away from Mon AM & Mon PM, or at least on their way to being there. My niece, her husband & my godchild are on their way to Alabama. Jakob’s sister, mother and nephew should be leaving for Memphis in an hour. Some are staying, many are leaving. Here’s to hoping for the best while preparing for the worst – the unofficial motto of Louisiana between the months of June & November. It goes without saying this isn’t typical of my entries, but in case you were wondering how this relates to my wedding. Simple. Our entire wedding party lives in southeast Louisiana. Almost our entire guest list lives there. But at the end of the day, it’s not about the wedding or how another hurricane could possibly impact it. It’s about the people in New Orleans. The city hasn’t fully recovered from Katrina – the last thing it needs is another major storm to undo the work that it’s taken three years to get done. It’s been a few days since my last post (I think). Sorry for the delay, but in my defense, I’ve been feeling like, well…a co-worker of mine described it as “my head feels like a water balloon” – like there’s stuff sloshing around in there. I hate being sick – I know no one likes being sick, but I REALLY hate it. Unfortunately, my job really doesn’t allow me the luxury of curling up in my bed and just sleeping it off so I’ve been going to work, coming home again, taking care of my zoo, and passing out. Rinse and repeat. Okay, so our second cake tasting was at Tee & Cakes in Boulder, Colorado. The cake artist there is named Kim – super nice, super cool chick! The shop itself appears to be a converted mechanic’s shop in the Pearl Street Mall, and it’s really what I think of when I think “Boulder”…kind of a combination of green, hippie, college chic. It’s cake tasting day! It’s cake tasting day! Yes, I’m actually doing a silly dance to go with my very silly song. Second only to photography, the cake is my single most important wedding expense. You see, I make cakes myself. I made my niece’s baby shower cake. I also made her wedding cake. I just found out my former coworker, Liz, is engaged! It’s so exciting to have someone else who’s also planning a wedding. She made the comment that it’s exciting & overwhelming at the same time. That’s the perfect way to describe wedding planning. There are days when it seems like the whole planning process can be a bit much. I have papers with floral ideas and lists of photographers, a wedding planner that is half filled out, business cards and bridal magazines all over my dining room table. Bridal books are taking over my bookcase, and I have well over 100 wedding-related bookmarks on my computer. Most nights, I come home from work and spend 90% of my time researching various aspects of the planning process. However, I’m sure the day of the wedding, when I see everything come together, it will all be worth it. Okay, so I promised to reveal the venue where we decided to have our wedding, and here it is. This is the view from one of the balconies at Marys Lake Lodge, the place where we have decided to have our beautiful mountain wedding! It meets all of the requirements I talked. It’s in Estes Park with views of the mountains (see? Mountains!) and nearby lodging, and catering is onsite. I cannot tell you how relived I am that we’ve finally made a decision and we’re dealing with someone who acts like they want our business. At this point in the planning process, I felt like we should have been sure about where our ceremony & reception would be held. And I almost gave myself an ulcer worrying about it not having one. As promised, today I will tell you the story of what is perhaps the most embarrassing thing I’ve done thus far while planning my wedding. I posted a crappy photo of my engagement ring that I took myself a while back. It’s a white gold euro band with four channel set princess cut diamonds on each side of a princess cut diamond, flanked by four round diamonds on each side – in a square pattern. The princess diamond is set on an angle, which I love because it’s so unique. A few weeks after Jakob proposed, I was at work and looked down at my ring and realized one of the round diamonds was no longer there. Of course my first reaction was to freak out, then I remembered he got the extended protection plan (smart cookie, I say) so I called the jeweler and they told me bring it in and they’d fix it no problem. Apparently one of the prongs had just broken right off. I got it back in a day or two, and it was good as new – better than new I guess. A few weeks after I got it back, I had this crazy dream that ALL of the stones fell out of my ring. The next day, I stopped at the jeweler and made them check all of the settings. Yeah, they probably thought I was crazy, and Jakob laughed at me. He even made me tell his friends the story and they laughed at me.